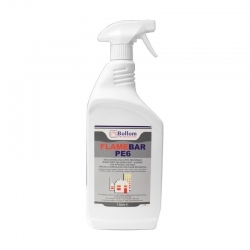 From the Flamebar product range, Bollom Flamebar S3 is a specially formulated, effective economical water-based flame retardant solution designed to improve safety on a range of portable absorbent textiles. 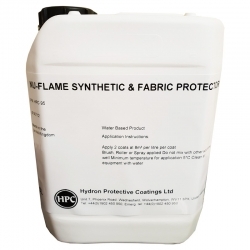 From the Flamebar product range, Bollom Flamebar S3 is a specially formulated, effective economical water based flame retardant solution designed to improve safety on a wide range of interior, portable asorbent textiles / lightweight materials. We recommend that a small sample is tested before application to main substrate, to check suitability and application rate. Dry and test with match or suitable flame. Correctly treated items should exhibit good flame retardancy with no smouldering or after glow. 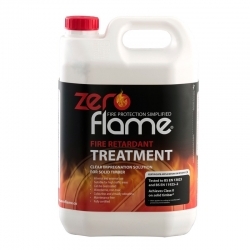 Flamebar solutions are supplied ready for use. In a warm ventilated atmosphere drying will be quicker, but be aware that drying too quickly can cause white marking on surface. A cool iron may be used. Will withstand dry cleaning solvents but needs re-application after washing or other exposure to water. It is long lasting in dry conditions. It is not possible to produce a non ignitable finish on all materials. The level varies, but the most effective treatments are on absorbent materials like cotton and other natural fibres; wood, straw, cardboard and paper products etc. Synthetic materials are more difficult to treat with most plastics being extremely difficult to upgrade this way. Finishes like scotchguard stain proofing present difficulties of penetration. 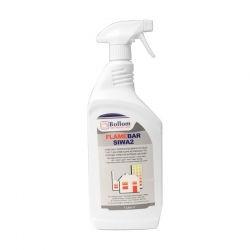 The purpose is to obtain the best flame retardancy possible with the particular material applying the most suitable flame retardant this is to make the material more difficult to ignite, to slow any flame spread down to a minimum and prevent smouldering. In this way, in case of fire, it helps along with other measures to provide a time delay for people to evacuate the area safely. It is the responsibility of the end user to validate the product is fit for their application. Refer to Health and Safety Sheet before use. Apply by spraying or dipping. Test samples first for suitability and level of treatment. 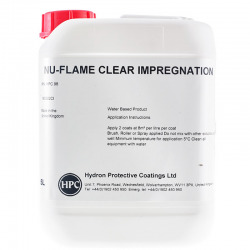 Check appearance when dry and fire retardancy with a flame. Normally solutions are used as supplied but in certain cases may need to be diluted. Use trigger spray, garden type pump up sprayer or airless spray. Spray uniformly from about 30-40cm on clean, dry material. One treatment may be sufficient but repeat after drying if required. Excess may cause some stiffening. Two light sprayings are preferable to one heavy application. Adopt instructions for application to wood and paper products, boards, wall coverings and foam. Wash all equipment after use with clean water. Use plastic or stainless steel container. Ascertain concentration required by test. Soak clean material in solution until wet out (1-2 minutes). Wring out evenly, preferably through hand or power wringer leaving in about 75% of the original weight of fabric. Dry, avoiding excess localised heat, a cool iron may be used, do not dip velvet or pile fabrics (must be sprayed). Performance: Correctly treated items exhibit good flame retardancy with no smouldering or afterglow, but some items like synthetics which are non absorbent are more difficult to treat. The treatment is long lasting in dry conditions. It withstands dry cleaning but reapply after washing. Good fast colours are normally not affected. Protect mirrors, metals, decorative and polished surfaces. Wash with clean water. 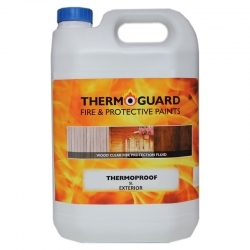 Thermoguard Thermoproof Interior Fluid is a clear, colourless, penetrating Fire Protection with an optional functional Thermoguard Thermoproof Interior Sealer for wear, damp &amp; UV resistance available in clear or woodstain colours. Thermoguard Thermoproof Interior Sealer is available in a matt or satin finish and is used as a protective coat to be applied over Thermoguard Thermoproof Interior Fluid where protection from wear, damp & UV resistance is required. Thermoguard Thermoproof Interior Sealer is available in clear or woodstain colours.